A man accused of attacking a soldier who later died in hospital from serious head injuries has had the charges against him dropped. Pte Matt Brooks, 18, from Trowbridge in Wiltshire, was assaulted near Yates's bar in Portsmouth on 13 May. Dean Aldcroft, 21, of Warwick Crescent, Southsea, had been charged with manslaughter and common assault. Prosecutors at Winchester Crown Court conceded they could not disprove Mr Aldcroft acted in self defence. Winchester Crown Court heard that after having "carefully reviewed" the case against Mr Aldcroft, prosecutors had proposed dropping the charges. 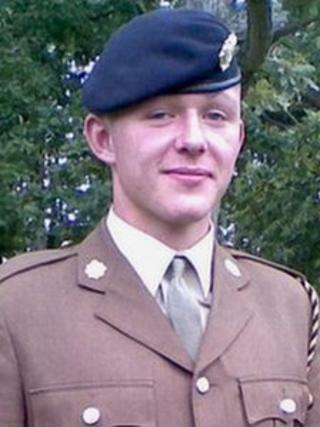 A court spokeswoman said the family of Pte Brooks had been informed. The soldier was serving in the Army's Royal Logistics Corps and was enrolled on a course at HMS Sultan, in Gosport, when he was injured in the car park in Alec Rose Lane, behind Guildhall Walk shortly before midnight. He suffered serious head injuries and died five days later at Southampton General Hospital. Pte Brooks' parents paid tribute to their son after his death and said: "Matt will be greatly missed by everyone who knew him, especially his mum, dad and girlfriend Laura. "He touched so many hearts and filled them with love, laughter and happiness. He loved life and lived it to the full, and was proud to be a soldier."